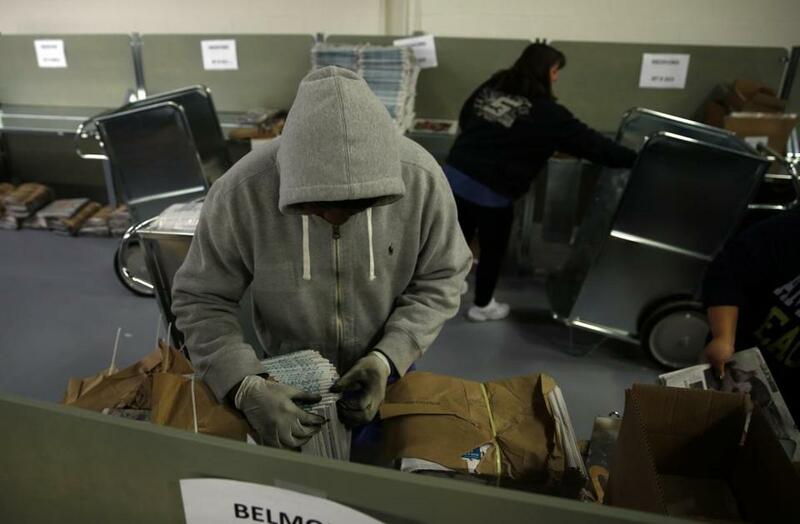 A Globe delivery worker bundled papers and bagged them in a distribution center in Woburn earlier this month. The once-obscure world of newspaper delivery burst into view this month as the result of the Globe’s messy transition from its previous distributor, Publishers Circulation Fulfillment Inc., to a new vendor, ACI Media Group. Thousands of subscribers stopped receiving papers at their doorsteps because the new company didn’t have enough drivers to cover all its delivery routes. One reason they didn’t have enough drivers was because ACI set up contorted routes, meaning it took drivers longer to deliver the same number of papers. Many concluded that it simply wasn’t worth it. And who can blame them? Drivers get no vacation, and lack worker protections. That’s despite the fact that packaging papers into plastic bags, in the middle of the night, can be grueling work. The Globe, like the New York Times, Wall Street Journal, and other newspapers, outsources its deliveries to companies that, in turn, hire the carriers as independent contractors. But some drivers, including the North Shore deliverers who walked out Sunday, contend they should be classified as employees, which would make them subject to minimum wage laws and other worker protections. It should be noted that the Globe’s current owner and publisher, John W. Henry, inherited that arrangement from its previous owner, the New York Times, and that it’s the same distribution model that most large newspapers have used since paperboys and paper girls passed into memory. The Globe does not hire carriers directly. Attorney General Maura Healey and federal labor authorities should take an independent look at the newspaper distribution industry — in this region, and nationwide. If the way the Globe and other papers are distributed runs afoul of state or federal labor laws, distributors must change their employment practices. In recent years, courts have sent mixed messages: the Orange County Register reached a settlement with carriers, but a Massachusetts case related to the Athol Daily News upheld the legality of the independent contractor model. In 2009, PCF settled a lawsuit for $1.4 million and agreed to end some labor practices, like docking the pay of workers if subscribers reported that their newspapers were wet. The delivery woes that the Globe has experienced during its transition to a new delivery company have been jarring — late papers, misplaced papers, and papers that haven’t been delivered at all. But the labor practices need to be scrutinized by an outside investigator — with an eye toward building in basic protections for the workforce that puts newspapers on doorsteps seven days a week.